DCMS top level policy document to promote the “dual competitive advantages” of the UK's strengths in creativity and technology. Paper resulting from the Culture White Paper, the Bazalgette Review of the Creative Industries, and specifically the Digital Culture Project, which explored how culture and technology can work together to drive audience engagement, boost the capability of cultural organisations, and unleash the creative potential of technology. 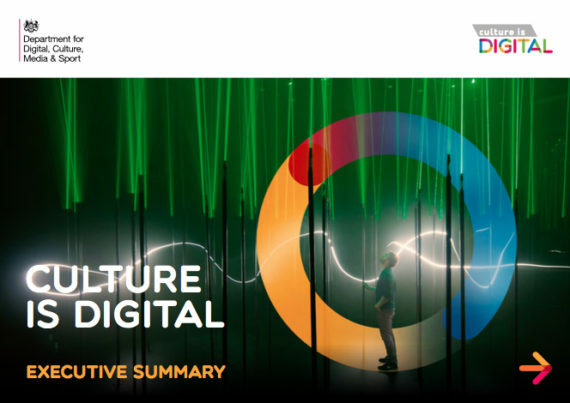 Bringing these and other top level policy strands together, this paper sets out specific but broad-based strategic priorities including a Digital Culture Network under the auspices of ACE, and a grants programme to increase digital capacity in arts organisations. This is likely to become an important document over the next few years, guiding the work of ACE, HLF and other organisations.